The Lost Colony is fast paced and full of interesting characters that will keep the reader engaged. This book by Eoin Colfer is the fifth book in the Artemis Fowl series and excels all books prior in this sci-fi series. The first few stories in this series mainly focus on Artemis being a greedy criminal. 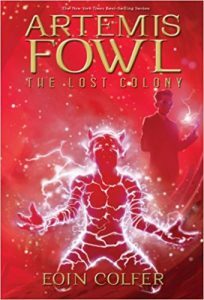 In this book, however, Artemis Fowl is the protagonist and will do whatever it takes to save the world from the demons of Hybras who are determined on taking over the world. Also Artemis meets the female version of himself, Minerva Pizarro who creates much conflict throughout the book with her selfish mindset. Now with the help of some new friends, and some old, will Artemis Fowl succeed, or will he miserably fail on his quest to save humans and fairies? The Lost Colony was very different than many other novels in the series, because it introduced another species of fairies, the demons. Also I noticed throughout the book, each situation brought on a new enemy with different motives. Another aspect of this fictional story I enjoyed, is Colfer changed between multiple characters point of views. This aspect helped the book stay interesting, even in parts when it would seem boring in most cases. The main theme of this book I thought was to do the right thing, because in many situations if Artemis was selfish other characters may have died. Also the setting changes nearly every chapter which really keeps the reader on its toes. However, one problem I had with the book was that it started a little slow and readers with little patience would never finish this book. I would recommend this book to readers who like sci-fi and fantasy stories.